"Without interaction, exchange of values and warm reception there cannot be human development and quality of existance..."
Also in the kitchen of the School of Chiappera the wind blows around its own direction.. and that’s the reason why we would like to express with humility and passion all those colours and tastes typical of the Maira Valley by proposing dishes and recipes of our old traditions. By walking around the paths of our valley it seems as if you could still hear the echo of the “carus”, those wagons full of salted fish: the anchovy, fish that has made the history and fortune of many “anciuè” (anchovies sellers), determined men that used to walk through all alpine valleys and flatlands searching for new buyers. Our purpose is to rediscover together with you the simple taste of a pasta filled with plants and herbs that grow exclusively in mountain grazing lands, like the "orle" or the wild spinaches which used to cover spontaneously the paths of this valley. Also the “gnocchi” are a typical dish, enriched by locally-produced cheese, like the “nostrale”, the toma cheese of hill areas, the goat cheese and the local ricotta, served with honey produced in high mountain areas. 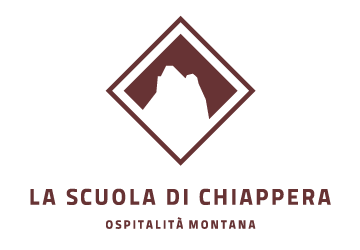 Pierpaolo and Stefano waits for you in the School of Chiappera, hoping to share with you the emotions, also the culinary ones, that this marvelous valley gives us every day. Our partner in the kitchen, selected by the chef of "La scuola di Chiappera".